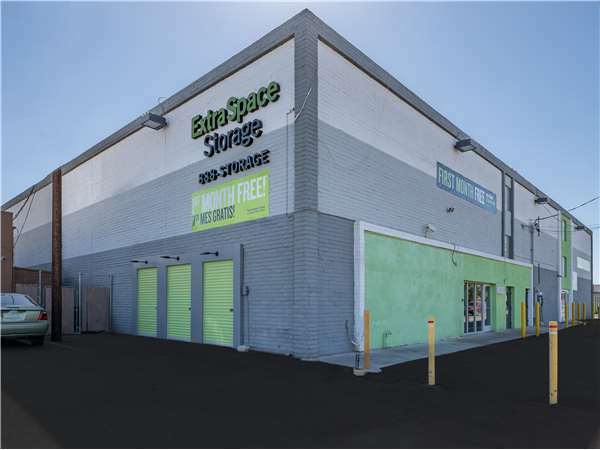 Located near the intersection of W Missouri Ave and N 27th Ave, Extra Space Storage serves Phoenix residents near Alhambra, Encanto Village, Glendale, Maryvale Village, and more. Locals will recognize our facility next to Circle K gas station. Are you a college student who needs self storage in Phoenix over the summer or while studying abroad? Extra Space Storage is about 1.3 miles from the GCU campus, making us a great option for you! Extra Space Storage on W Missouri Ave has a wide range of storage units, climate-controlled storage, drive-up access, and exceptional security. We're your go-to storage solution in Phoenix near Alhambra! This place is great!! Customer service is awesome, the price is good, it's convientlu located, clean, and safe. I love this place! I have been here for 2 years & have never had a problem. Employees are helpful & knowledgeable. I just downsized to another unit & they made it so easy that all I had to do was show up & start moving my stuff! Ally, Tarik & Issac, YOU GUYS ARE THE BEST!! THANK YOU!! Terrible company! They increase the rent every few months for no reason! My rent has increased by $30 in the last 2 years. Their security is no where near acceptable and God forbid your unit get broke into, they will not review the footage to assist with any investigation unless you pay extra every month. I can't wait to move my belongings out of this place! The price is pretty decent. The size of the unit is good. I was however, disappointed after we had our first heavy rain (monsoon) of the summer. There was a puddle of water about 6 to 8 feet into our unit. It soaked a few boxes. Luckily we didn't have our main product stored in the front of the storage unit. Management came to look at what happened and said, the seals on the door seem to be fine. They may look fine, but the fact of the matter is they did not keep water from getting into my storage unit. I was instructed to put my property on pallets. Up until this monsoon season I was very satisfied, but having to reorganize to put everything on pallets changed my opinion of the place a bit. Extra Space Storage is wonderful to us because although the surrounding area is horrible (full of methheads and thieves and wolves in sheeps clothing) The entire building and complex itself is very secure. we appreciate the use of higher grade technology they have implemented too. the level of accountability is there just as it should be. everything logged and monitored. we feel as though our belongings are perfectly safe right in the surrounding area of clearly present danger. the two employees we spoke with (Christy and Tarik) both operate at a very high level of professionalism and courteousness that's well sought after. great service and the feeling of comfort for the well being of my belongings is still here and very much alive. It's a great clean building and everyone is nice. It very affordable and I really didn't have much of a problem. It has great customer service and they can really help me with anything of my account and storage. Drive south on N 27th Ave. Pass Montebello School and continue south. Turn right onto W Missouri Ave. Our facility will be immediately on your left. Drive north on N 27th Ave. Pass AutoZone and continue north. Turn left onto W Missouri Ave. Our facility will be immediately on your left. Drive west on W Bethany Home Rd. Pass I-17 and continue west. Turn left onto N 27th Ave. Turn right onto W Missouri Ave. Our facility will be immediately on your left. Drive east on W Bethany Home Rd. Pass Walmart and continue east. Turn right onto N 27th Ave. Turn right onto W Missouri Ave. Our facility will be immediately on your left.